Advocate Sujay Kantawala tells us all about his first work of full length fiction. An avid follower of current events, he never shoes from sharing his opinion on television debates. He has also published three coffee-table books of poetry. He is committed to the environment and has personally planted more than 1500 trees. He regularly appears in matters relating to social causes in the form of PILs. All this is in addition to his legal profession. Meet Sujay Kantawala who tells us more about his first fictional book. 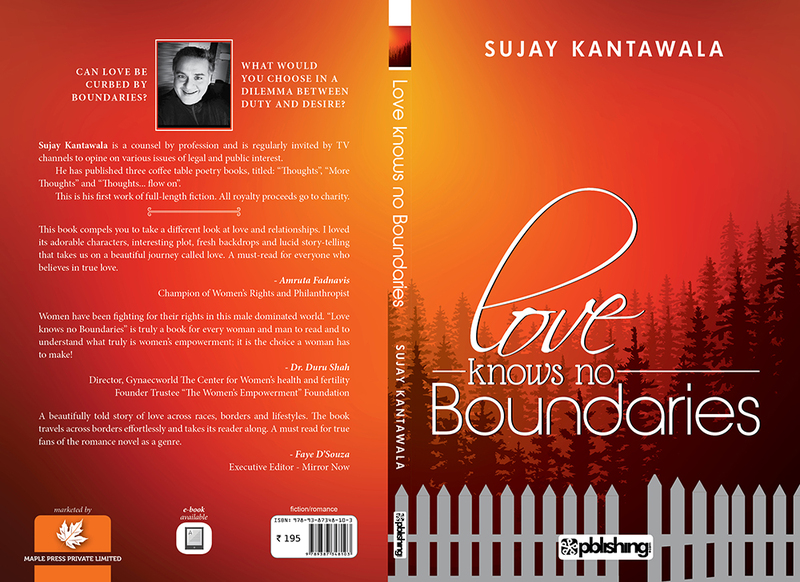 Tell us something about your book ‘Love Knows No Boundaries’? My book revolves around an inter-faith couple who meet by sheer chance. The man is a Muslim belonging to a Royal Family somewhere in North Africa. The woman is a staunch Hindu, raised as an orphan at an Ashram in Rishikesh, India. Destiny brings them together and they realize that in order to maintain their relationship and remain intensely attracted to each other, living under the same roof is not a practical option. They also realize that marriage is a mere ritual and what is important in life is commitment, respect and honour for each other. That must be the basis of any relationship. They travel all over the world together and thereafter go about their mundane duties in their respective territories. However, since Shaquille and Ritambhara are caught up in their respective professions they decide that they will meet each other for 4-5 days in a month. By chance, a young couple meets them in the most extra-ordinary circumstances and while relating their personal story, they change the life of the young couple. I am hoping that after reading this book, many couples would think differently and the message has a profound effect on the destiny of many couples who have lost track and are miserable. What inspired you to write your book and how has your profession being an advocate influence your writing? My book is inspired by current events of today. I am regularly seeing relationships, especially marriages breaking down at very early stages. The reasons normally are that young couples find it difficult to compromise and when they start living under the same roof, the need for space, causes variety of problems. The book is born out of a dream that I had and being an Advocate and being proficient in the English language, I had the necessary tools to weave the fictional story albeit, with a message. Which is harder to write, fiction or nonfiction? What according to you is the current state of English writing in India? I have always felt that the current state of English writing in India has shown improvement to a great extent. Indian Writers are doing excellent work. The only problem arises when the book becomes too long as the attention of the reader then has the tendency to go awry. What are your future plans as far as other books are concerned? As far as my future plans are concerned, I have already completed half of my second book, which is based on murder and has many twists and turns. I am making every attempt to enthrall my reader and I am making efforts to keep the flow of language coupled with the story line as simple as possible. Again, the inspiration is a result of reading variety of judgments on various issues and I am sure that the book will be well received.